Here is a look at my initial mock draft for the 2019 season broken down into four parts and continuing with picks, 17-24. Click here for picks, 9-16. Make sure to check out our ‘Mock Draft Podcast’ edition of Ourlads’ Guide to the 2019 NFL Draft. Dan Shonka and I go in-depth on every pick in the first round. If the Giants land QB Dwayne Haskins with the 6th pick, this would be a good spot to go with OLB Brian Burns. But since we have the Giants taking their edge-rusher (Ferrell) at No. 6, the decision could come down to Brown, QB Daniel Jones, OT Andre Dillard or DL Ed Oliver. With Jones off the board – and he would be my pick here - I’m going say they take Brown because adding an explosive outside receiver to the mix with Odell gone is important and I believe they can get their right tackle at No. 37. QB – In this yearly game of NFL Draft poker, it’s hard to tell what the Giants truly intend to do with their top pick. I think there’s a good chance they’ll swing a deal with the Jets to go after Haskins, but if they can’t or aren’t that interested, then taking Jones at No. 17 is also an option. RT – G.M. Dave Gettleman has done a good job upgrading the talent along the offensive line. The deal to bring in RG Kevin Zeitler from the Browns was an excellent one. But one more spot up-front must be addressed and it needs to be addressed early. WR – Golden Tate was a nice pick-up, but he’s better in the slot which means the Giants need to bring in another outside receiver at some point during the draft. 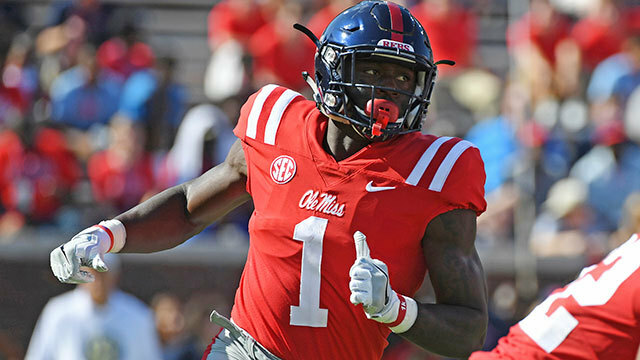 CB – The Giants used a 2019 third-round pick in last year’s supplemental draft to select CB Sam Beal. Beal injured his shoulder on the first day of training camp and missed his rookie campaign. Whether Beal turns into a quality starter though is still a mystery, which is why the Giants have to add another top rotation corner to this unit, especially with starter BW Webb leaving for Cincinnati. Salary cap issues are making this an important draft process for the Vikings and owning 10 picks is a good start. Replenishing talent and depth on the offensive line and fixing some issues that popped-up last season in the secondary should be their main focus. The Vikings also have primary back-up issues all over the offense at QB, RB, TE & WR. Oh, and if any team needs to draft a kicker, especially with 10 picks, it’s this one. LG – The Vikings lost Tom Compton to the Jets and released Mike Remmers to save money. They can try and upgrade this position early if they really like Cody Ford and are willing to take him at No. 18. No matter what, expect the Vikings to add two to three lineman starting with a guard. DE – Danielle Hunter is one of the top edge-rushing ends in football, but because it’s looking more likely the Vikings will trade Everson Griffen to free up cap space, this is going to be a major priority moving forward. If the Vikings don’t like Ford enough to take him with their first pick, then I can see them going with a player like Burns instead. CB – All of a sudden the Vikings have questions here after learning undrafted gem, Holton Hill, will miss the first four games with a drug suspension. They also might not be able to afford a new contract for Trae Waynes after the season. And don’t forget they lost last year’s top pick, Mike Hughes, to an ACL injury, so no one knows how well he’ll respond after playing just six games as a rookie. K – The Vikings haven’t been able to feel at-ease with their kicking game since Blair Walsh was selected in the 6th-round in 2012. Now Minnesota needs to spend another late-round pick on trying to solve their long-term plans for this underrated position. DEPTH – Minnesota needs top back-ups at several key positions after losing QB Trevor Siemian and RB Latavius Murray to free-agency. They also need a young tight-end to push Kyle Rudolph, who also enters his walk year, and add another rotation wide-receiver as well. With the hiring of a defensive assistant (Mike Vrabel) to run the team, the promotion of former TE coach Arthur Smith to run the offense, and with the success of Derrick Henry in the running game last season, the Titans are looking more and more like a conservative, power-running team. That’s why OG Cody Ford could end up here as well. I’m going with Hockenson though, because can learn from Delanie Walker and help bolster the passing game which has been a major issue here for years. OLB – With Brian Orakpo retired and Derrick Morgan also moving on, the Titans decided to add 37-year-old Cameron Wake to the roster as a temporary fix until younger talent are drafted and developed. OG – With both starting guards playing elsewhere this season, the Titans made a good move and signed LG Roger Saffold. Now they have to fill that hole at right guard which is why Ford would make sense here too. TE – Walker turns 35 in August and is coming off a serious ankle injury sustained in Week 1 last season while Jonnu Smith is still no sure thing moving forward. Keep in mind their new OC coached this unit the last three seasons. WR – The jury is still out on 2017 first-round pick, Corey Davis, while a reliable No. 2 on the outside is also missing. The Titans did add former Buccaneers WR Adam Humphries to the slot in March. CB – Logan Ryan will return this season following a broken leg in December and he’s scheduled for free-agency in 2020. More depth should be brought in at some point, but I wouldn’t expect that to be too early. Even after losing three key skill position offensive players, the Steelers are still stocked with enough talent to compete for a championship thanks to smart drafting (RB James Conner), trades (TE Vance McDonald) and free-agency moves (WR Donte Moncrief). I believe this first pick should be an easy decision based on need and the talent available in this year’s class to solve that need. But if all the top edge-rushers are unavailable by No. 20, the Steelers will have to decide whether to select someone a bit earlier than expected or go with the top player on their board to add depth. LB – TJ Watt was a great first-round pick in 2017, but fellow first-round pick Bud Dupree has been a failure so far. Dupree will get one more season to prove his worth, but the Steelers need insurance in case he doesn’t make the grade. They also need more talent inside as well, but will probably have to wait until after the first-round to fill that need. CB – The Steelers signed former Chiefs CB Steven Nelson who will replace free-agent, Coty Sensabaugh. While this is not a 2019 priority, Pittsburgh has to look ahead at 2020 when Joe Haden and Mike Hilton become free-agents. RT – Former DII lineman and Steelers RT Matt Feiler was a huge bonus after starting nine games last season and OT Chukwuma Okorafor was taken in the third-round last year. But neither player is a sure thing, so the Steelers should think about adding more young depth to this area as well. Seattle only has four picks in this year’s draft, so look for a potential trade or two to acquire back some collateral. DE Frank Clark and WR Doug Baldwin could be candidates. Either way, I get the feeling the Seahawks are getting ready to make some bold moves. OL – It seems like this has been a priority for Seattle for far too many years. Once again they should try and upgrade this unit by adding at least one more starter at a minimum. If it were me, this selection would go to C Garrett Bradbury. But when it comes to making a smart decision on offensive lineman, the Seahawks usually fail. CB – Seattle needs to replace Justin Coleman and would probably be very happy if Greedy Williams were to slip down the board. Keep an eye though on Joejuan Williams from Vanderbilt as a potential second or third-round selection. We know how much Pete Carroll loves his tall corners. WR – Doug Baldwin has been banged-up lately and could go under the knife again soon for a sports hernia issue. Even if he were to make a full recovery, the Seahawks have to add an impact player here. DE – If they indeed trade Frank Clark, then this becomes a much bigger priority position. Keep an eye on Jaylon Ferguson who is probably a day-two selection. Not that it every stopped Seattle from taking a player they liked a round or two higher than expected. Bradbury could end up as the top overall lineman in this year’s draft. So isn’t it better to take the top player at his position and then wait until later to go with other positions of need like a linebacker and a receiver? LB – The Ravens lost their top two sack producers (Za’Darius Smith/Terrell Suggs) and their leading tackler (CJ Mosley) from this unit. They need to get some players back in return. WR – After losing John Brown to Buffalo and cutting Michael Crabtree, the Ravens have to replace two of their top three receivers. They did use picks last year on Jaleel Scott (4th) and Jordan Lasley (5th), but what they really need is a true No. 1. C/OG – The Ravens appear set at both tackle spots and they still have a premier guard in Marshal Yanda. But Yanda’s 34 and the other two interior positions need an upgrade. The Texans are on a run of three division titles in four seasons, and on top of that they already have their franchise quarterback (Deshaun Watson) an elite receiver (DeAndre Hopkins) and a star on defense (JJ Watt). But if the Texans are going to improve upon their unimpressive 1-3 playoff record over these last four years, they’re going to have to keep plugging up several remaining holes. And it wouldn’t hurt to deliver the elite Watson/Hopkins tandem at least one more difference-maker on offense to help open up the offense even more. OL – Just like last year this is Houston’s primary need position. The main spot to address is right tackle after Kendall Lamm signed with Cleveland. Seantrel Henderson signed a one-year deal, but he’s returning from a broken ankle and hasn’t started more than three games over the last three seasons combined. Last year’s 3rd-round pick, Martinas Rankin, made three unremarkable starts at left tackle, but the Texans see him more as a swing tackle or a potential future starter inside. DB – There are plenty of moving parts here that still need work after CB Kareem Jackson left for Denver and S Ty Mathieu signed on with Kansas City. The Texans replaced Mathieu with free-agent Tashaun Gipson and gave fellow free-agent CB Bradley Roby a one-year show-me deal while also adding versatile DB Briean Boddy-Calhoun to the mix. But with CB Johnathan Joseph turning 34 and with two contributors at corner still remaining unsigned (Kayvon Webster/Shareece Wright), the Texans need to add at least one more outside corner to this unit. RB – We thought the Texans would think long and hard about adding another running back last year, but they declined on that option and re-signed Alfred Blue. With Blue now gone for good, it’s time for an upgrade. The Texans do like 2017 3rd-round pick D’Onta Foreman, but he only played in 10 games last year after injuring his Achilles as a rookie. TE – Just like the running back position the Texans have some decent options here but should strive for more. Rookie 6th-round pick, Jordan Thomas, appears to have the biggest upside after grabbing four TDs while FA Darren Fells joined the team from Cleveland. Using their first-round pick on either Noah Fant or TJ Hockenson would be a boost for the offense. WR – Once you get past the four primary need positions, the rest of this roster is about adding depth. The starting trio of Hopkins, Will Fuller and Keke Coutee is as strong as they come. But Fuller’s missed 15 games over two seasons and rookie Coutee missed ten last year with hamstring issues. With four picks in the first 35 we started the Raiders draft off by taking DE Rashan Gary. You might think we would have moved on to another position, but Oakland should take advantage of the players still available on the defensive front and do what they can to make fans forget that they lost Khalil Mack. Other potential options here include RB (Josh Jacobs), TE (Noah Fant), OG (Cody Ford), DE (Jaylon Ferguson) and corner (Deandre Baker).